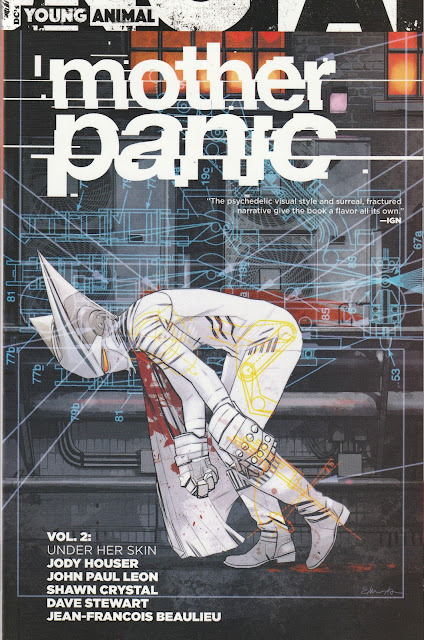 I unfortunately did not read this series before reading the Milk Wars crossover issue, and so my reading of Mother Panic has always been skewed by my knowledge of what was to come. I don't think it detracted from my enjoyment of the story, just inflected it slightly. I'll say this for Gerard Way and his creators - they're doing some tight storytelling in all of these books. I was trying to figure out what kind of feeling Mother Panic gave me, what it reminded me of, and then it finally came to me: The Prisoner. This all reads very much like the plot of that seminal series of the 1960s. Even Mother's white suit, its clean lines, are very Mod. The Gather House experiments are straight out of Cold War spy fiction, and Mother Panic's origin resembles nothing so much as the Black Widow's origin. Is there some homage there, a take on the character, but in white instead of black? And the remnants of Gather House that keep popping up are terrifying. Not quite insane. Alien, perhaps. That might be a good way to look at it - they've been made alien, Violet included. Art and story are insanely strong, which I should have mentioned in my review of the first volume, and might have but my memory's not great, but will mention here too just to stress the point. Top level superhero storytelling here. Violet Page is fascinating, and I can't wait to see what happens in the strange Gotham City she finds herself in at the end of Milk Wars.